Good news to the Nokia fans on this blog Entclass.com. Nokia is set to release another smartphone code name Nokia D1C. 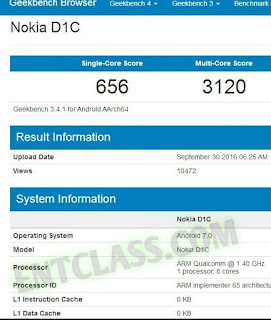 According to the Geekbench benchmark test ran by someone, the benchmark result reveals that the upcoming smartphone from Nokia has the name Nokia D1C. This is not yet made official. The benchmark result also revealed a MSM8937 motherboard which is a product number for Qualcomm Snapdragon 430. This also means it going to come with a Adreno 505 GPU. Benchmark result also revealed some of the specifications of this upcoming phone. 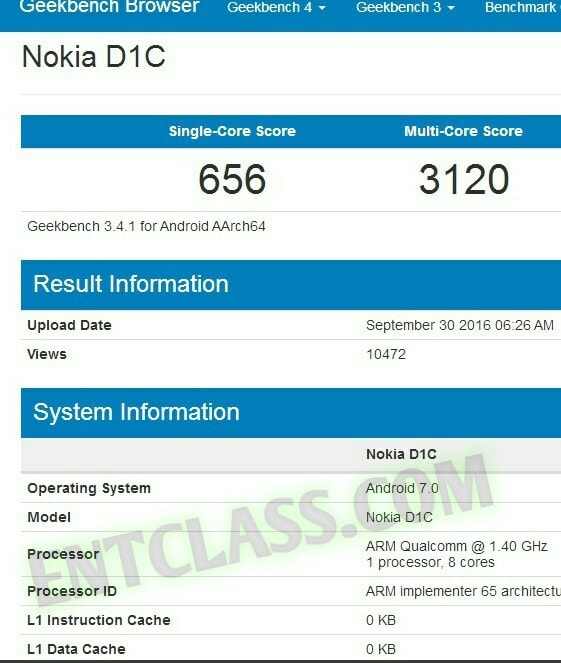 Below are the unofficial specs of the yet to be announced Nokia D1C.